Our first ”cloning” challenge (we actually only do the PCR part) consisted in optimizing the PCR protocols for the High-Fidelity Cloning from cDNA. Human SLUG (NM_003068), VSP24 (NM_016079.3) and NKCC2 (NM_000338.2) needed to be amplified from human cDNA provided by a customer at the CR-CHUM in Montréal. Cloning primers were designed by the customer. The customer mentionned that other DNA polymerases failed at amplifying their desired full-lenght genes, The researcher provided us with PCR primers and 2 cDNAs. Please find bellow a resume of what we have accomplished using Transgen Biotech’s High-Fidelity DNA Polymerases. Primer sequences to achieve Cloning from cDNA were as follows. Even if overall primer melting temperatures (Tm) were from 61 to 69 °C, we attempted PCR amplfication of human SLUG and VSP24 from human cDNA in the presence or not of 1X PCR Stimulant. Amplification of SLUG was perfect under the conditions used whereas and increase of 2-3 °C for the annealing temperature was recommended to the researcher. 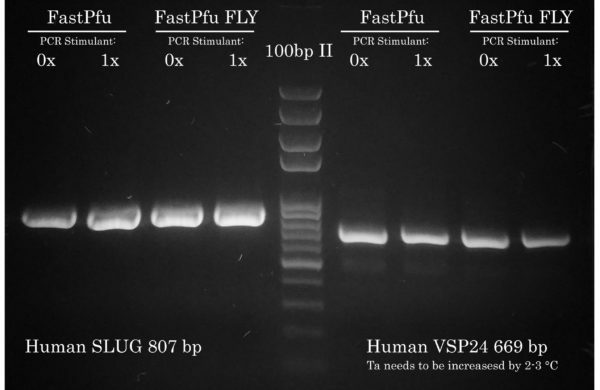 Since TransStart FastPfu FLY ‘s fidelity is twice as better than FastPfu, we recommended to the researcher to use the former Ultra-HiFi DNA Polymerase. The PCR amplfication of human NKCC2 from human cDNA was pretty straighforward and was perfectly successful on our first attempt. 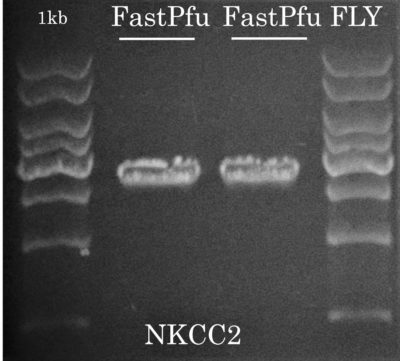 Since TransStart FastPfu FLY ‘s fidelity is twice as better than FastPfu, we recommended to the researcher to use FLY in their own attempt to perform the Cloning from cDNA in their lab.